Where are the statues of great academics? Perhaps it’s because so many are involved in committees and are therefore disqualified by G K Chesterton’s comment: “I’ve searched all the parks in all the cities and found no statues of committees”. But really there aren’t huge numbers – I can recall statues of Newton and Darwin and there is one of Alan Turing I think but not someone like Professor Herman Pálsson, a wonderful Icelandic scholar who taught at the University of Edinburgh for nearly 40 years (to pick one of my favourite tutors at random). 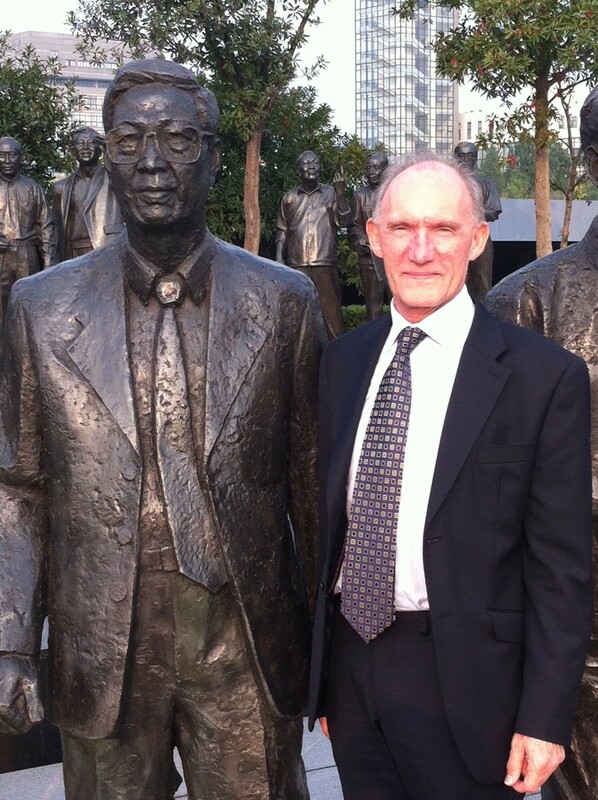 This is a picture of our Vice-Chancellor with a statue of our Chancellor Emeritus, Professor Yang Fujia, a notable Physicist and former President of Fudan University as well as member of the Chinese Academy of Sciences. Look more closely at the picture though and you will notice that there are more statues behind them. In fact there are 94 in this particular park, all leading academics originally from Ningbo (also home of the University of Nottingham Ningbo China). This is just extraordinary. The idea of a city having one or two statues of academics would be surprising but a whole park full of them? You just could not envisage it happening in the UK. At least not right now. But why not? Perhaps part of valuing universities “for their intrinsic, as well as economic, worth” (Page 17, Coalition Mid-Term Review, 7 January 2013) should be about reminding everyone just how great academics at UK universities are (wherever in the world they are from). So come on BIS, why not commission a few statues. This entry was posted in BIS, Government, HE, international, University of Nottingham and tagged academics, HE, international, Ningbo, statues, University of Nottingham, UNNC, Yang Fujia by Paul. Bookmark the permalink. Maybe its something the Victorians did more of this? There’s a statue of Lord Kelvin in the Belfast Botanical gardens, next to Queens. The old University of London building in Burlington gardens (I remember it as the Museum of Mankind, but now its the back of the Royal Academy) with Galileo, Goethe, La Place, Galen, Cicero, Aristotle, Plato, Archimedes, Justinian, Hunter, Hume, Davy, Leibnitz, Cuvier, Linnaeus, Newton, Bentham, Milton, Harvey, Adam Smith, Locke, Bacon.